benzyrnill, 旎宫嘉坊: a busy week, nephew returned from college entrance exam&join cyberlife here. a busy week, nephew returned from college entrance exam&join cyberlife here. its nice cool morning. last night i really painful when i dreamed of the suffering of my baby and my Royal. i envisaged the dictator of China devised a conspire, let my alone spend at will while my expending all at cost of my family's fixed income. if i eat and play well,then they suffered lost and pain. the authority surveillance it and only me don't know the plot. the imaging i saw many times in my distressed time before fall into asylum, i never afford to see my Royal suffering, and that let me fight on 2 front lines and broke me apart several times. it drizzled since dusk just after i visited toilet and sat in the front yard of my dad's house and started to sing. it lasted when i busy in night to claiming myself another facebook account, benzillar land. 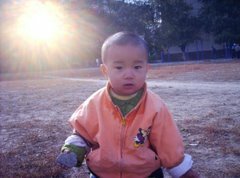 i decided in dream that return to Qiqihar to care baby soon after it turns daytime. but after woke up the anxiety decreased and my faith in the Mightiest God resumes. i know that God wouldn't let my Royal under his shine suffer the evils the demon in China exerts, God wouldn't let me in dark any more helplessly. if he want to alert me something, i can know but usually not great fear or distress. the most time of following God should be joy and peace. its a nice morning now. i can anticipate some sunshine later. rain day really beautiful and let me productive. i know Masheng for whom i stayed here waiting for 4 months likes to introduce girl lǔ to me, let me review her love in the past years in the rain. the night before last night, i told baby my girls prepared villas in Taibei, Beijing, Shanghai, Wuhan, Nanjing, for our gathering to come. he giggled and likely his mother, ema, also listening. baby these days yet don't want to talk me online. its a long road leading me to God's shine, but not a slow way to God. decided to follow God not always peaceful, sometimes it can rock/torn u out of track, like the several moments my heart torn by imagery dilemma in which my beloved&myself can't move or respond but just suffering pains of helplessness. they r all God's show on me before i find the way toward his door. God loves true love, and true lover. like the bible says, there is only spirit in the world. anything just a load of the spirit. ok, its a nice morning to disclose my distress, and difference a faith in God brings. i always in need to declare, that i forever follow God, no matte how the seeing and delusion how can persuading my urgent action to save my beloved. i love God, the only creator of Universe and the Mightiest. glory forever belongs to him and never a devil can leave a smog on it. i never want to live in fear and unbalanced.